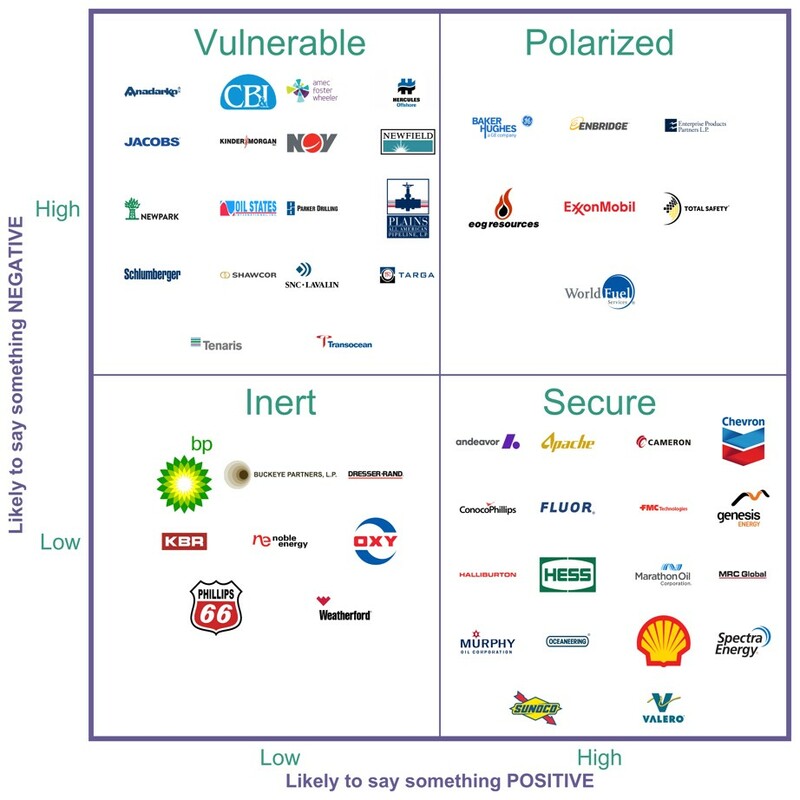 What should Oil & Gas Companies learn from their Customer Feedback? We surveyed 1,219 managers in the oil and gas industry to rate their likelihood to engage in positive and negative word-of-mouth for the top brands in the oil and gas industry. This survey was conducted as part of the C-CUBESTM Collaborative. 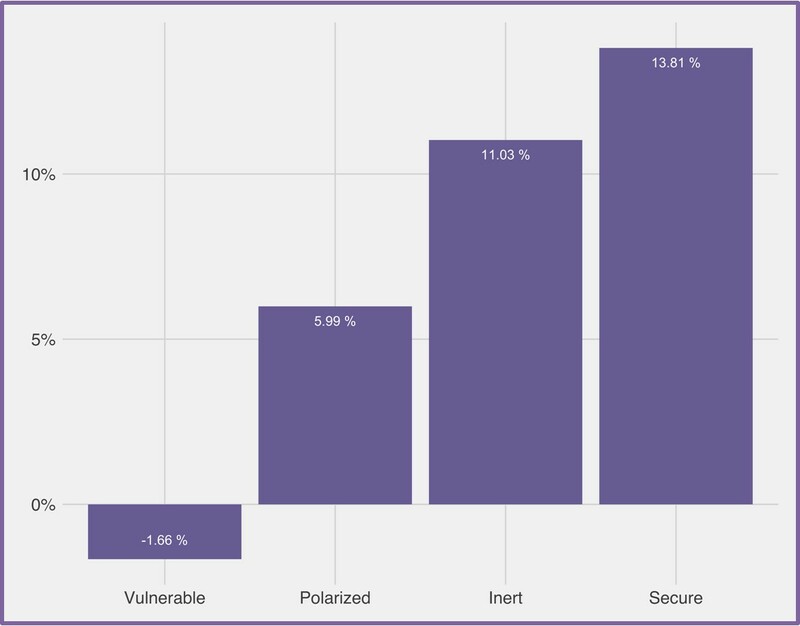 Our results, shown in Figure 1, reveal 35 percent of the brands we studied were vulnerable, 35 percent were secure, and 16 percent were polarized. Why does this matter? Because this simple analysis can help companies predict sales growth. Among the 31 companies for which we could access sales data, we found that secure brands had by far the highest quarterly sales growth rate, at 13.81 percent. Vulnerable brands, on the other hand, showed a sales decline of nearly 2 percent. At roughly 6 percent, polarized brands had less than half the sales-growth rate of secure brands. "Customer voice is a powerful diagnostic." Secure companies poised for higher growth include Fluor, ConocoPhillips, Apache, Oceaneering and TechnipFMC. Judging by customer response, companies such as National Oilwell Varco, Jacobs, Tenaris, and Kinder Morgan are vulnerable and should focus on improving customer satisfaction. Polarized companies such as Enbridge and EOG need to focus on eliminating negative word-of-mouth by addressing factors that cause dissatisfaction among customers. Simply increasing positive-word-of mouth without mitigating dissatisfaction can only hurt polarized brands. As the price of crude oil rises, energy companies are beginning to bank on sales growth to boost shareholder returns. Our conversations with executives reveal that they are largely focusing on new technology to deliver product innovation and lower prices. These are predictable and understandable goals, but the real focus should be on customer satisfaction. For one thing, satisfied customers are more likely to generate positive word-of-mouth, helping sales growth through recommendations and referrals. Meanwhile, dissatisfied customers can be expected to spread their complaints throughout their social and business networks, inhibiting growth by sowing doubt and stealing the spotlight from customers who praise the company. The lesson? Simple and insightful, customer voice is a powerful diagnostic that can help evaluate a company’s competitive position. If companies in the oil and gas industry ignore it, and focus instead on technology, they do so at their own peril. The Houston Strategy Forum is hosting professors Mittal and Sridhar at the Strategic Customer Conference on May 31, 2018, along with twelve business leaders. Come learn from these top minds. 2018 - Customer Conference.